Measure resistance to ground from BACKLIGHT_ON and PANEL_BKLT_CTRL on the eDP connector. 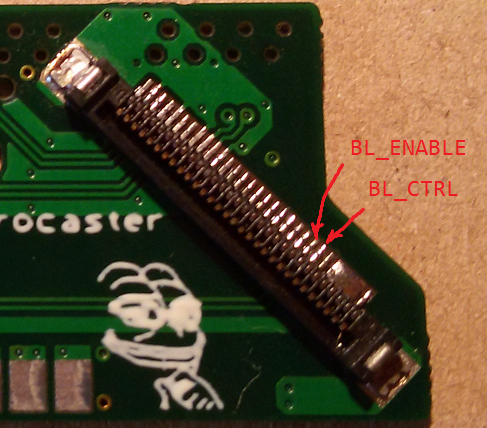 Measured the pins according to the picture, BL_CTRL to ground is 7.9 Mohm, BL_ENABLE to ground is 9.6 Mohm. OMG what a great work ! Thank you so much Nitrocaster, you are my hero !! So definitely needs at least one of these mods! I need the kits, its still available for me to pre order for 2nd batch! Excellent Mod! Are the kits likely to be available again? pasodoff wrote: Excellent Mod! Are the kits likely to be available again? Yes but as this is a one man job by Nitrocaster...it all takes time. It's not only one man job, but the fact that parts are sourced from China and Chinese and/or Russian post is being particularly slow during the last months. I had the mod working but after some mucking around I lost brightness control. CAn you publish some troubleshooting info ( voltage / resistances ) ? You didn't disconnect all power before mucking around, did you? Ok guys, after 3 months I had chance to mount this adapter with my SPB4 FHD screen. Totally a fail. I made by myself soldering work and it was not so bad. The screen was working but, as you can see in the photo, it had some "flickering problem" or interference. Ok, I was managing to touch the cables inside, like the LVDS and it seemed to resolve the "flickering". Then I had the happy idea to remove the edp cable from motherboard when the pc was on and now the screen stay black. It turns on but no image appear. Nitro, can I trow my screen? EDIT: Imounted the old TFT screen and it worked. Now I re-mounted the FHD screen and it works but the "interference" remains. EDIT 2: I touched a bit the LDVS (white flat cable) and the screen became black. No answer. It's on, but black. Got a 13.3 screen in the post the other day, in the hope of giving the X330 mod a go. My list of thinkpads for fancier screens is growing. has someone here experience with the mod and macos? It works well in Windows. The Edid ist also correct. Any directions where I could investigate further? Last edited by paperfactory on Thu Apr 20, 2017 3:53 am, edited 1 time in total. Never mind, it works, but I had forgotten about the need to keep LVDS1 active to allow for brightness control. TankPad wrote: Got a 13.3 screen in the post the other day, in the hope of giving the X330 mod a go. My list of thinkpads for fancier screens is growing. Which screen did you get? Where did you get it from? To learn about the DSDT patching stuff they are talking about in your InsanelyMac link. I put that link there only to be (hopefully) helpful, as it referred to the same GPU. Otherwise I have absolutely no interest whatsoever in anything Mac/Fruit. If you could do me a huge favor and check for me, that would be really helpful, thanks! Are you sure you received exactly the JW03? Although the seller promised to send out the JW03. I got the right panels from ugooole on ebay (http://www.ebay.com/itm/13-3-LCD-Screen ... 1899062614). Looks like the first one I got from aliexpress isn't for sale anymore. No probs, I'll check it out. I'm pretty sure it is this one. I got mine from eBay too. as Boutch said below. Do tell. I'm planning to do the mod while using Ubuntu. Thanks. I had the FHD working well, but since a few days, X doesn't show on my panel any more. That is, as soon as X starts, the image disappears. Importantly, the boot screen and Win7 still display correctly, so it almost has to be a software or system error. My external monitor does still capture the output and I am pretty sure it isn't a backlight issue. I got it to work again (until the next X restart). Perhaps the EDID is corrupted? If anyone needs help installing their mod board, just shoot me a private message here or email me at me@charlesmoyes.com -- I'm happy to perform installations (and screen replacements) for you! I did this to fake 1920x1080 on my x220, just a minor hiccup of xrandr starting up when X starts. If you want it to run every time at startup, then the above process should work fine. Last edited by phage on Thu Jul 27, 2017 10:14 am, edited 1 time in total. Still, why it used worked without this, and still works without problems in Win7, puzzles me! nitrocaster wrote: No, you poke holes through the polyamide tape that you stick on the adapter board. No. Just place the adapter board over it and solder 7 plated though holes. I'd love to make a video on how to do that, but that would require unmodded motherboard and some assistance with the camera. I'll be installing this mod for some local buyers. We'll see. Video would be fantastic, too bad you are not in NYC, I would be able to help with the camera. Thank you for that information. 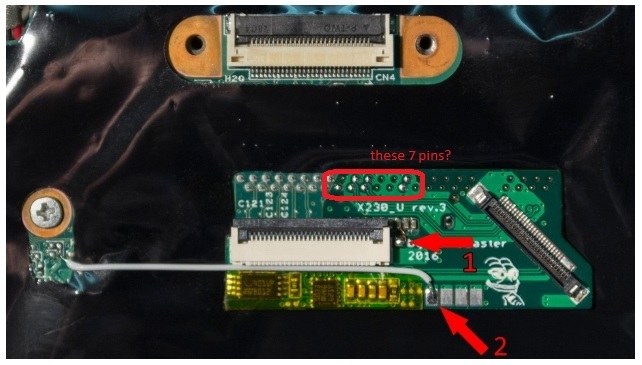 Is this the photo for the 7 pins (better for me to confirm)? So I will apply Kapton to the back, poke 7 holes, solder the 7 connections + sense wire + auxilary wire and that will be all the soldering necessary? This was/is the confusing part as it's not clearly identified in the manual. I'd gladly help providing support for documenting and providing clarity if needed Nitro. One question...the laptop mini-display port connector on my x230 with the FHD mod...should work fine right? Whenever I plug in a display, my laptop does seem to send the image the display but it seems to freeze. When I disconnect the display, I can't get it to respond to keyboard/trackpoint/mouse. Edit: Seem's my issue is with Fedora. I booted into Xubuntu and all is fine. I sent you a PM, do you still have kits for sale?